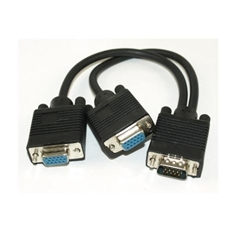 Black VGA Y Cable, Low Resolution, HD15 Male to 2 x HD15 Female, 8 inch This 8 inch HD15 Male to HD15 Female monitor cable splitter will split a low resolution video signal coming from a computer so that you can display the same image on 2 monitors. This cable is good for resolutions only up to 800 x 600. It is recommended to keep the cable runs from this splitter to 15 ft or less. If you are looking to go farther than 15 ft, you will need to use one of the following distribution amplifiers or you may lose quality of signal: 41H1-14812, 41H1-14814, 41H1-14818 or 41H1-148116.